As to my plans for the publication of Bernard Shaw's essay on Nordau's "Degeneration" I can as yet say nothing more definite than the type is set and the plates are made. The book will appear as soon as the releasing word shall come from Mr. Shaw. far to the rear and well-nigh lost to view. If the narrator of the story were not a barber, and somewhat more of a discerner in the world of thought, he would know this. Speaking of Jesus, Zarathustra laments his too early death, and declares that he himself would have disavowed his doctrine if he had lived. "Noble enough was he to disavow!" Johann Schmidt also, I think, is noble enough to purify his philisophy and philanthropy of all Christian taint when he comes to see the offence which lies therein, and he may come to see it the more speedily if he will take time from his newly-won happiness to read and study the work of an eminent and celebrated namesake of his, "The Ego and His Own," by Johann Caspar Schmidt, who wrote over the pseudonym of Max Stirner. The lord bishop of London is so cocky over his defeat of Roosevelt at tennis that now he is ready for any old fight. "I defy any one," he says, "to find any other reason why we are alive than that the Eternal God said, 'Let there be light.'" I shall not accept the challenge; but it occurs to me that, if the lord bishop of London is mentally so constituted that he is content with the reason that he himself has discovered his own existence would be more easily explicable had the Eternal God said, "Let there be darkness." like. 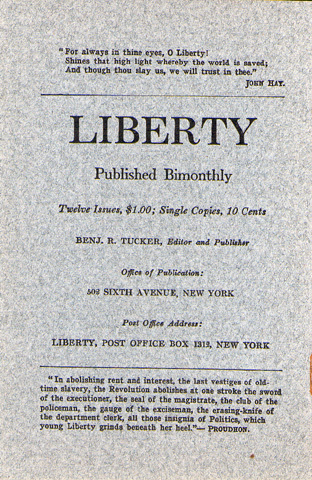 Nearly three weeks after the publication of Liberty the same story was "specially cabled" to the New York "Times." At least, such is the "Times's" claim. Enterprising paper, the "Times"! Professor Jenks came all the way from Cornell the other day to tell Columbia students that "wether the State be Anarchistic or Socialistic can be determined only by the will of the citizens." When will the Cornell professor of physics visit Columbia to proclaim that wether water shall be dry or wet can be determined only by the will of the physicists? Professor Jenks also told the students that "most citizens have but a hazy idea of what is meant by the State." As usual, the professor is with the majority. Mr. Harry Kelly, in the New York "Sun," declares that he must group himself with Thoreau, Whitman, and Emerson. Probably the reason why he must do this is that nobody else will do it for him. Mr. Kelly, claiming to be an Anarchist, is sufficiently consistent to help himself. Considering how many men clearly guilty of murder are now acquitted because juries disbelieve in capital punishment and refuse to send any man to his death if a shadow of a sentimental excuse can be found for him, Mr. Bonaparte's proposed addition to the number of capital offences, if it could be adopted in any State, would paralyze the criminal courts. There is no danger of such an act being passed anywhere, and its advocacy is enough to bring in serious question the judgement of any man. Cranks are not the best material from which to fill high and responsible public positions. Mr. Bonaparte believes, however, that the freer infliction of capital punishment in former times and the unsanitary condition of jails killed off malefactors before they could form a habit of criminality. But compared to those who perished in this way the number who offended with impunity and offended habitually was practically unlimited. The nomadic bands who made highway robberty a profession, and the hideous thugs and assassins who haunted all the ancient capitals, were surely examples of the habitual criminal. Perhaps the attorney-general meant that in old times there were no corporations. He always is so facetious! In Napoleon Bonaparte's last instructions for the king of Rome there is this sentence: "Let my son often read and reflect on history: this is the only true philosophy." Napolean would have given the same advice to his family and relatives, and their descendants, had he respected their intelligence. But he was notoriously contemtuous of his brothers, and knew that, to reflect on history, mind is necessary. He would hardly advise our attorney-general to "reflect" on history. been characterized from the bench as "a disgrace to civilization," and their statutes as vicious, demagogical, etc. The theory, as stated by the authorities on constitutional law, is that legislation is presumed to be valid until shown to be otherwise, and that courts are careful, cautious, and extremely slow to reach conclusions unfavorable to acts of law-making bodies. In practice every doubt is given to the tricky and mendacious corporations, and even the pretence of respect for legislative discretion is being abandoned. The are everything, the legislative and executive departments nothing --- as Lysander Spooner argued and predicted they would be. And think of the hypocrisy of it all! When the Bryan platform of 1896 parenthetically intimated that the strained income-tax decision might be reversed by a future supreme court, all the patriots and safe-and-sane gentry affected horror at such an "assault" on the judiciary. What do judges and lawyers think of the present assaults of corporation-ridden courts on legislatures and executives? sion-a pretension first advanced by Marshall, the champion "twister," and successfully maintained since his day. Any independant thinker of intelligence is certain to concur in this view. If the framers of the constitution had intended to give the courts the power to invalidate acts of congress, they would have said so plainly, and would undoubtedly have qualified and restricted the exercise of this power. They might have provided for unanimous or three-fourths-majority decisions in constitutional cases; they probably would have withheld the power, in any event, from the inferior federal courts, which congress can change, abolish and re-create at will. In short, palpable anomalies and absurdities would have been avoided. But the truth is, there is no warrant for judicial nullification of legislation, and the people have submitted to this gigantic and amazing usurpation through superstition, credulity, and weakness. Let us hope the time has come to challenge this monstrous perversion. "Wait a moment, I don't want you to applaud this part unless you are willing also to applaud the part I read first, to which you listened in silence. I want you to understand that I will stand just as straight for the rights of the honest man who wins his fortune by honest methods as I will stand against the dishonest man who wins a fortune by dishonest methods." He then went back and re-read the passage referred to, saying that he wanted his hearers "to applaud the other sentiment also," and, when they had done so to his satisfaction, he continued, "Thank you, now I'll go on." indeed, a very characteristic incident. It shows Roosevelt's asininity in several ways. The people had not applauded the "other sentiment" simply because it was superflous and platitudinous. Who ever objected to the defending of honest fortunes won by honest men? There was something novel and courageous, to the unsophisticated, In Roosevelt's talk of fighting dishonest methods and dishonest men, for they know from observation and reading that governments are not in the habit of fighting the rich and powerful criminals, and so they applauded. Nothing could be more natural. But the preternaturally virtuous and stoical Roosevelt, with an eye on the newspapers, was bound to secure applause for the platitude also, in order to parade his "even-handed justice" and his independence. The consideration that applause that is "wanted" and requested is valueless and meaningless did not occur to him. that rich criminals shall be pardoned wholesale while no mercy whatever is shown to the poor and obscure offenders? Modesty is not considered a Roosevelt quality, yet the latest series of presidential speeches argues an astonishing degree of self-restraint and reserve in their author. Roosevelt is an apostle of righteousness, of common sense, of true manliness. He does not, however, define these terms for us. He has been railed at by carping critics and mean souls for this vagueness; they do not perceive that, if he were to undertake to descend from glittering generalities to concrete propositions, his whole gospel would necessarily sum itself up in one word, "Rooseveltism," and his speeches would all read like this: "Watch me, follow and imitate me; applaud my policies, and you will have a lien, a firm hold on righteousness, common sense, and manliness. Others are either dangerous radicals (like Bryan, Tom Johnson, La Follette) or malignant reactionaries, like Foraker, Hughes, Knox. I alone am the embodiment of sane radicalism and philosophical conservatism. I alone know how far to go, where to stop, and when to reserve mysaelf." Now, this, though true to the letter, --- andonly rascally conspirators venture to deny it, --- would not be modest, and Roosevelt would rather be indefinate than immodest. corporations. He can see nothing alarming in federal injunctions against State officials, in arbitrary suspensions of State laws, in encroachments upon State rights and State jurisdictions, in distrust of and contempt for State courts. All this is quite compatible in his eyes with the "sacredness of law and order." Is judicial tyranny in the name of federalism less to be dreaded than executive tyranny? The Harveys and their clients object to federalism only when they think the interests of plutocracy menaced; they are loud defenders of State rights only when they "need" these "in their business." When federalism suits them, as it generally does, especially when the accomodating federal courts are the exponents of that doctrine, they lose all their affection and solicitude for State rights and the "government of the fathers." The artful dodging and gymnastics of the plutocratic editors were never more amusing than now. A congressional commission appointed to investigate the postal service is to "recommend the appointment of a director of posts, who shall be removed from politics, and who shall continue in office from administration to adninistration. He is to be subordinate to the postmaster-general, but it is intended that he shall be a business man of high qualifications, who shall have no concern except the carrying on of postal affairs without reference to politics." By this master-stroke of reform, I presume, the postmaster-general himself will be freed from all concern save that of carrying on postal affairs with reference to politics. I am surprised that there are not more good stories. I think there is not a day but I see on the streets some tragedy. Life is all a tragedy. Comedy is only tragedy in disguise. It paves the way for tears. We laugh as men learn to feast in a beleaguered city devoured of pestilence. If I had the time from my profession, --- I am a barber, --- I think I could write a good story, for every day I walk the streets. Last fall, on the corner of Clark street and Fourth avenue, I saw a blonde young man haranguing a group of fifteen or sixteen people at about half-past eight o'clock in the evening. The streets in that section were then deserted. He wore a pointed beard, after the style called Van Dyke, and looked like an artist, a poet, or freak of some sort. There was a suggestion of Christ, or of the painter Courbet in his youth. He was standing in the street, addressing this small knot of people on the sidewalk. I stopped too. I like Freaks. Most people are so respectable and commonplace. Respectability is conventionality, and conventionality is deadly dullness. In truth most men, like most leaves, have an inclination to be different, but the men are cowards. as to give every one his fair chance in life, --- a fair chance at the honey of this wonderful life-this one and only life. I stand here in the mud to-night to tell you those worthy preachers are working at the wrong end. I am a preacher to tell you that goodness is a question of time and geography. All morality, everywhere and in every time, is the search for happiness, and happiness does not begin till we are fed and warmed. Light, and warmth, and fine dishes to eat, and fine clothes to wear, and leisure time, and books, are not temptations to those who already have them. They are temptations to those who are cold and starving. Money is a temptation only to those who are pressed with needs and debts. Food is not a temptation to those who have food. Clothes are not a temptation to those who have clothes. Light, and laughter, and food, and drink, and warmth, and happiness, are only temptations to those who slink about the dark alleys and shiver in the cold garrets. freedom. The lack of an equal chance for all sober, honest people to live. That the root of inequality, of great wealth undeserved and great poverty undeserved, is the privileges given by law and government to the few who still drive the many as their slaves --- for you are all slaves. I stand here to tell you that the root of all privilige is in the laws, and that government is still the engine, moved by force and used by the few against the many, just as kings and emperors used it. Government to-day is only what is left of the government by kings. It all has the same purpose --- a few to exploit the many. There can be no freedom till the right to enforce any peacable man against his will is gone forever. Neither to tax him by force, nor in any way compel him by force so long as he himself is respectful of the rights of others. The ideal society is a voluntary association, and to approach that you must ged rid of these unequal laws and this idea of a government founded on force and compulsion. nomic freedom, and the gospel of freedom attained through 'Anarchy; Anarchy, which is the every-day ptactice of the Golden Rule.'" "He's a damned Anarchist," said one of the two men moving off together. "He's a damned fool," said the other. Just then a policeman who had joined the group a moment before put his hand on the preacher's shoulder, and said, "Come with me; I arrest you." "What for?" said the blonde young Vandyke. "None of your damned business," said the policeman; "you'll find out. Are you coming, or do you want the club?" --- and the big policeman held the club ready to strike. The young man eyed the weapon, smiled at the group, which was growing larger, and said, "This is government." Some one laughed. The big policeman glared around and said, "I'll take you too, you ---" (and he used bad language). He fixed his hand in the collar of the Anarchist, and, jerking him nearly off his feet, said viviously, "Come along now"; and they moved off. The crowd melted away. One man with a tin bucket and a grimed face said it was a damned shame. Most of the others laughed. mob worships the lunatic as its saviour. The rule never changes. It is inevitable. Were it otherwise, the sensible and sane stupid people of to-day would be as wise as the brilliant lunatics who open the wonderful gates for them. I know this, for I am of the mob myself. There are only to learned professions, the barbers and the cobblers. We have ample leisure. We can think at our work, and we are of the people. We also read a great deal. Some scientists, in accounting for the wisdom of barbers and cobblers, have said their shops are places of resort, and they pick up their knowledge from their customers. Heaven! Can you pick figs from thistles? Can you make omelets from pebbles? Most men do not think. The masses of men accept blindly the condition they are born into. The dullest of all are the respectable people. Not even every barber thinks. I am myself unusual. I read a great deal; having such a dyspepsia that I cannot drink, and not caring for cards, and being rather withered and rejected of women, I read much. There are some who think they think, but that is very different. Preachers belong to this class. here. Drunks; brawlers; petty larceny thieves; fake beggars and recruits from the great horde of vagrants, charged with the crime of "no visible means of support," which covers more sins than charity. Most of his fellow-cattle lay and looked at him in silence. Some slept. It was a hard cement floor; no bunks, no blankets. It was only the herding place for the night. They tried to borrow or steal any tobacco or money the police might not have taken. It was Saturday night, and toward midnight the place began to fill up. Helpless drunks, crazy drunks, tearful drunks, sick drunks, and noisy drunks; with an occasional offender against some more sober law, such as obtaining money under false pretences, as if such men are not to be honored when the money is a million. The air was poison, the noise pandemonium, and the night hell. One gentleman in evening dress, with an exceedingly dissipated shirt front, sang over and over again, "Here's a health to you, John Brown. Here's to you my jovial soul." Evidently the gentleman and his friend Mr. Brown were two souls with but a single thought. was over he was half graduated in crime, with disgrace on his head and revenge in his heart. A very pudgy little man, with his eyes tight shut, sang like an automaten, somewhat moaningly, "Jesus, lover of my soul." The noisy ones were not spared oaths or blows, both brutally given. The keen eyes and noses of the human rats quickly noticed that Schmidt was clean, and they called him "Duke" and "Soft Soap," and took as much pleasure in robbing him of his cleanliness as society does in ruining a woman's reputation. But all was done in goodnatured malice,--as in society. young Walsh; "say, Judge, let me have this." "Certainly," said Justice; "take it along." "He'll certainly raise a row about it," said young Walsh. "Who? Him? Not much. By the time he gets out of there he'll be glad to keep his mouth shut. Anyway, it's lost and can't be helped. Take it along if you want it," said Justice. Young Walsh cooled Justice with champagne and soothing words of praise, and over the bubbles they talked, each with satisfaction to himself, of the terrible danger to our institutions if such lawless incendiary cranks were permitted to be at large. Men with no regard for vested rights. the "Morning Truthteller" said that Schmidt was one of an organized band of desperate Anarchists. That such men were beyond the pale of that civilized and organized society whose very existence they threatened, and shouls be shot on sight, like mad dogs, or at least deported to some devil's Island. It should be said that the ideas of the "Truthteller" were furnished by a group of most respectable money bags, and were clothed in words by some verbal tailors kept for the purpose. I wonder if Salome went to look at John the Baptist in prison? How his heart must have rejoiced to see the lustre of her eyes, the whiteness of her hands, and to smell the clean fragrance of the cedar from her flowing robes of soft purple silk! For I suppose the prisons of Herod were as rayless, dank, and foul-smelling as those of Chicago, and the advent of a fragrant young girl must have been like a star alone in all the gloom of night, even though she came for his head. So, to Schmidt, came the Little Sister of the Prisoners,--hair of gold like the maize silk, teeth as white and regular as its pearly grains, lips as scarlet as the poppy, skin like rose petals upon creme, and brave wide grey eyeslike the skies of morning. She came thrice a week, bringing chocolate, oranges, lemons, paper, postage stamps, testaments and other books, little paper bags of tobacco, and such like cravings. The bags of tobacco were more in demand than the testaments, It is a pity, but it is true. Elsa Bauer, daughter of the very, very, very rich brewer, Hermann Bauer. Motherless. She went her way, and old Hermann went his, making more and more money, so that his big, sleek, dappled horses in brass-mounted trappings could not have hauled his gold if it was put into one of those wonderful sacks we read of in Grimm. Her way lay toward the prisons and hospitals, for she took with a literalness which her friends thought comic Christ's exhoration to visit the sick and those in prison. Have you yourself who read this ever been in prison, or deserted in a hospital?--weary with the monotony of misery?--A forgotten thing?--A bit of wreckage on the shore?--And the bright sunny world at it's play recklessly?--Weak, so that tears will come, from self-pity?--Hopeless, so that hardness grows from self-knowledge of degredation? The sick and those in prison need a touch of sympathy--a breath of God's own fresh air. Really, if you have yourself ever been sick or in prison, you will find Christ's words not so laughable. headed, hard-working, illeterate old German brewer. Elsa, like all the real vitality, brains,and morality of this life, was also near to the all-powerful, everrenewing mother, the soil. He was the root; she was the flower. The first generation of culture; sensible, wellinformed, well-educated. Each went his and her own way, and left the other free. That is true happiness, --to be free. No one is. Love is a wonderful force. It is certainly first cousin to electricity, which splits the oak and even sometimes rends a church. You look into a woman's eyes, and like a flash you are in love. You see a perfect stranger, and you love her. You are ready to mate with her. But she passes on; you never see her again, and she is forgotten. How many of these tragedies there are! Lost opportunities! Desertions! I myself have loved so many beautiful women who never knew it. Nor do I believe barbers are more susceptible than other men. It is bitter, this indifference to small bald men. --- If an acquaintance happens and ripens, then this first flash grows to a flame; but, none the less, it began instantly, like the stroke of lightning. Its signal is beauty. Certainly beauty is the great bait of the world. I am talking now of mating; that is love. Certainly for friendship and comradeship time is necessary, both to ripen and to prove them. It is in these comrade elements that love failures occur. No one ever doubted for an instant that he loved. There are no mistakes in love. They come afterward. throat of the people, and society be a voluntary association for the good of all. So that the children of men shall inherit the earth, and none shall be higher than his just place, and none lower than his just deserving. So that society shall for once be in tune with nature, and men and women be free to love and live as seems best to them, and once again nature's laws shall be unchained and men shall be free to rise in their virtues; aye, and free to descend in their vices,so that the fittest,the truly fittest,shall survive. So that the yearning which is in all men to freely expres their thoughts shall not be stifled by Church, or State, or custom, but men shall bud out as unreservedly as the trees bud and blossom. So that a new race of poets shall arise, and all men shall be poets in their unfettered thought and unrestrained expression. Freedom--Freedom--Freedom--for which my very soul pants now; if it may be breathed by my unborn brother of the coming centuries, it is a little thing that I have lain in jail, or climbed a gallows' step. I am an Anarchist--an apostyle of true human freedom." and Abendroth! Think of it! and for what? Think of it! Why, it is like Christ over again. Siegrfied felt the silence, and said quietly, "There is always a good in suffering. Had I not been thrust into jail, I had been so unfortunate as never to have seen in you, Mademessoille, the practical goodness of the human heart." "You dream an ideal," she said, hesitatingly. "I do. And all, all, all that the world is rich today, the steam engine as well as Christianity, 'Hamlet' as well as the Declaration of Independence, electricity as well as the 'Goetterdaemmerung,' is from the dreamer of ideals. Banish ideals, and man remains a dweller in caves, a feeder on the flesh of his kind. Yes, Miss; I do dream an ideal, and in that is my hope. The ideal of to-day is the real of to-morrow." told her, She turned and left, without a word. to the Little Sister, and asked for his effects. They were handed to him, and he looked at once for his miniature and exclaimed quickly, "Where is the picture which was here?" No one knew anything about it. "Did you value it highly?" said the Little Sister. "Beyond expression," said Siegfried gloomily, and the Little Sister's heart became gloomy also. She wrote her address on a slip of paper, and said, "Please call on me to-morrow morning at eleven. I wish to propose some work for you." Siegfried bowed silently. His eyes were troubled. She left, and hers were troubled also. After she left, Schmidt questioned more about his picture, but it was useless. The officer had returned all he received, and could swear to it. And Schmidt went away with his favorite curse upon his lips, "And this is government." Thus did Johann Schmidt become the secretary or prime minister of the Little Sister of the Prisoners in her work among the naked and the hungry, and those sick and in prison. You may take my word for it, as a close student of human-nature,--which a barber must be,--that beauty is a great bait. It is something more than a bait. It is a spark to powder. Even silly beauty is this, and most beauty is brainless. But, when you have great beauty of soul and depth of mind added to ravishing beauty of face and form, that is something that will conquer angels,--unless angels are just puffs of damp air; I do not know. Juliet had been shut up alone on a tropic isle. I was sent for once to shave a minister of the gospel (that is what he called himself). He had been sick, and was convalescent; and some other ministers of the gospel were with him to discuss a law to compel amusement parks to close on Sunday. They fell to talking of how immoral plays are, and they spoke of this play "Romeo and Juliet," and the one I was shaving said how very immoral it was. Morals are, as I have said, a matter of time and geography. It is moral to do in Turkey and China what it is very immoral to do here. The one I was shaving said it was a common scandal the way Romeo and Juliet, should have turned their thoughts to God,--just here my brush slipped, I was so mad, and filled his mouth with lather, but he blew it away and continued,--and to Jesus. He spoke as if Jesus were a medicine. The Little Sister and her Siegfried were Juliet and Romeo alone on an island. The end was certain. They loved each other. If I were composing a tale out of my head, I would not be so foolish as to make young Walsh know Elsa Bauer. It would not be necessary, and it would seem improbable. Though, after all, the rich set is a small community everywhere. because she had told that to only one person, herself, --- and then in great alarm, --- but he could know that this Anarchist of hers was straight, strong, beautiful fearless, god-like, with the enthusiasm of a reformer and the magneticism of an enthusiast. That he talked at least three languages, had traveled, knew books and good manners. He had asked Elsa once, "Who is this secretary of yours?" and she had answered, "I don't know, and I don't care," in a way that required the subject to be changed. For she was a character of rock crystal and an only child, and, as Hermann Bauer idolized her and had at least twenty millions, she was not to be dictated to. She did not know, and she did not care. Over and over in her heart, like a prayer wheel, went the question, "Who is he? No ordinary man. The face of Christ. A soul I will stake my soul for--and yet, yet, yet--Who is he?" SAhe knew he had been a riding-master, a fencing-master, waiter in a restaurant, coachman, teacher of German, and what else? What else? helpless man. Leave it with me. I will restore the stolen property to its owner." She was bitter. Mr. Walsh was angry. He told her her protege was still talking Anarchy on the streets, and she said to him, "I know it, and I know the Anarchy he talks: a gospel of peace; of uplifting; of a fair chance to all men; of the downfall of artificial privileges; of voluntary association. I know it. It is the Anarchy of Christ. Peace on earth, good will toward men. Would God there were more such as he!" He thought, "By God! He has converted her." The wide fearless eyes of the Little Sister of the Prisoners were on him. She was a soul thousands of volts stronger than he. She dismissed him. she, herself, another Elsa, had lost her Lohengrin. Lost! He had never been hers. Here was beauty greater than her own lying before her. And yet she could swear he had been and was hers--yes, swear it, by that wordless recognition of love by love. This page has been accessed by visitors outside of Pitzer College times since February 13, 2001.